Hellooo! I go by the name Sentrock & i’m an artist living in Chicago. Lets start with the name Sentrock, where did that name come from? My name came from a friend of mine in High school, I just got caught tagging at school, so I was trying to come up with a new alias haha which then my homie said I “should write “SENT” like Heaven sent because your all into God”. The more I got into breakin” (break dancing) I just added the “ROCK”. So I been Sentrock for about 10 years now. That’s actually really tight. When did you first start getting into art? I got into art at a very early age. In the 1st grade I was introduced through a community artist program. Hmm.. I’d have to say being able to create something from nothing, like giving your community something that wouldn’t exist with out you. Where do you get your inspiration from to create? I’d have to say mostly what I see around me and I how I grew up. I do. My favorite artists are Tupac and Kendrick Lamar. I don’t really have favorites , because I think all artists are dope. That’s awesome, Tupac & Kendrick both had/have great messages to spread to the youth. With your work, is there any special message you’re trying to communicate to the viewers? When it comes to my art, I look to always put hope and encouragement in each piece I create. Throughout the years, is there one piece you’ve done that you’re most proud of? 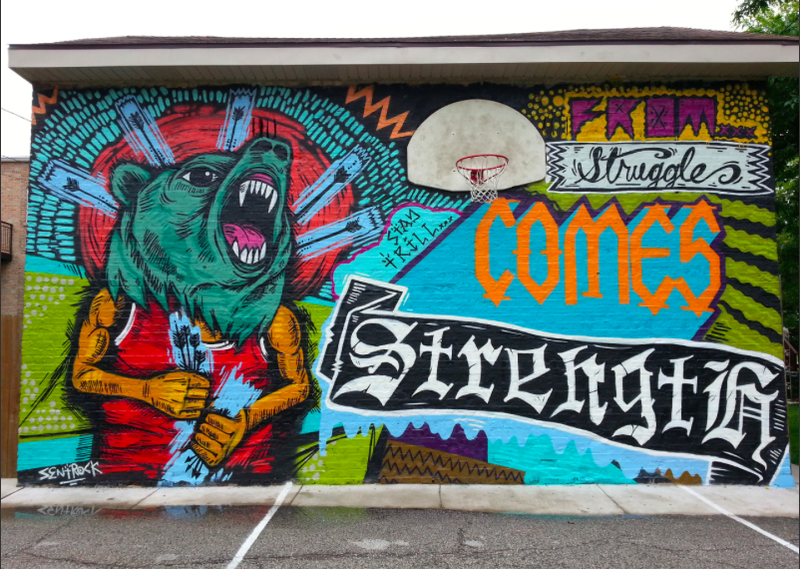 Yeah, “strength from struggle” mural I did in Lawndale. 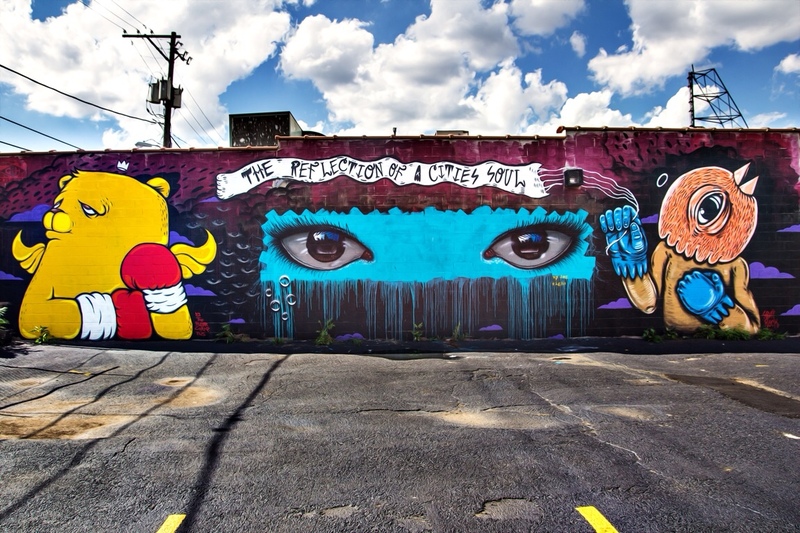 West Side Chicago. 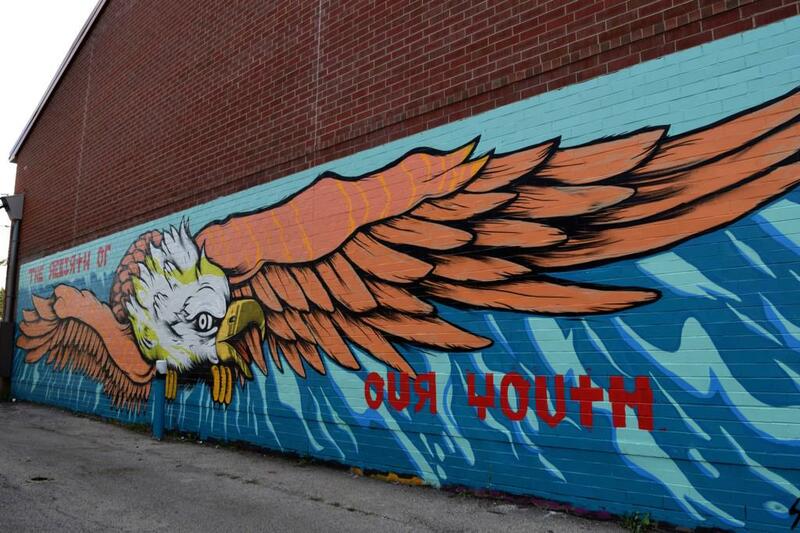 That’s a sweet piece, i’d have to say my favorite of yours would be the For the Day Dreamers & Goal Getters in Pilsen. One question i’m sure you get a lot is, what’s the meaning behind your bird character. Is there a specific meaning or was it just something you liked and stuck with? Yeah that’s a frequently asked question, but yes there’s a meaning behind it, It’s a symbol for freedom. You are originally from Phoenix but moved here to Chicago. Any similarities between Az and Chicago? I grew up in West Phoenix, I live in West Chicago. They are both environments of hustlers and down to earth people tryna make the most of what they have. While in Chicago, you obtained a degree from Columbia College. (Congrats). Do you feel in this day that its necessary for students to study art and receive a degree? Or do you believe it’s possible to build yourself up without a degree? Good question. Look at kanye West. He was a college dropout and look at his career now. Success is what you make it. Creativity is all around us, you don’t need school, you need passion for what you want to achieve. That’s great advice. Throughout your journey being an artist, what have you taken away? What have you learned that you apply to your everyday life? Did you ever feel like giving up? That maybe all of this may not work out the way you wanted it to? That I am always a student and every opportunity I have to create, I’m going to take it. I cant give up, I say I am but, one way or another these ideas will manifest. As an artist, do you believe you have a role to show society? 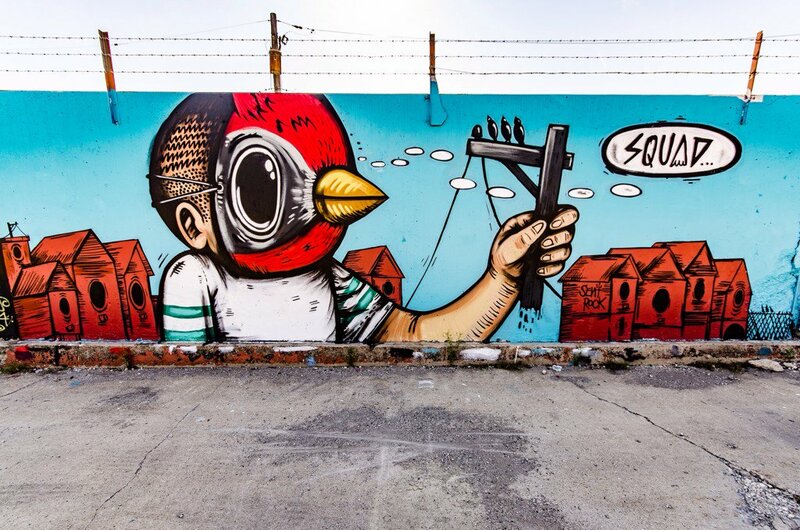 For sure, artists remind society of the “other”, of something more than the everyday routines. You just recently became an Art Teacher at Foreman high school. Explain that, how excited are you to be able to teach kids looking to pursue art? 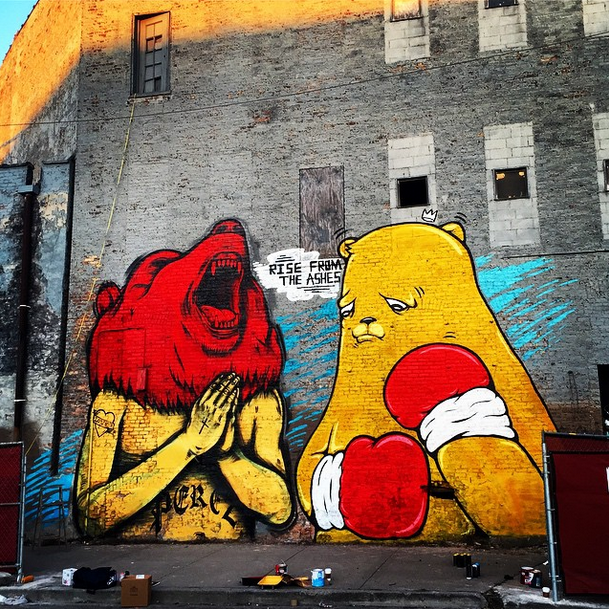 I teach an after school street art class, I just want to be able to expose students to something else. Just giving tools to the kids, that’s all. That’s awesome. For you man, at the end of it all, what do you want people to take away mst from you as an artist? At the end of the day I just want people to know that i’m a reflection of my environment. Do you have any advice to give to any young artists trying to come up? Stay humble, push yourself to create your greatest work and stay positive. Things will eventully fall into place. Thanks for the time, do you have any shoutouts you’d like to give? To YOU! Thank you for your time. Keep pushing and telling the stories of the creative ones! 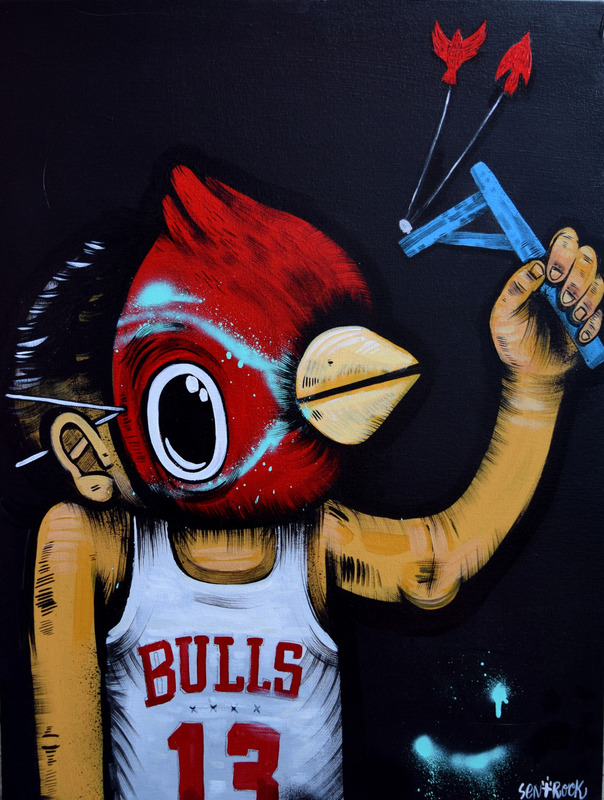 Check out some of Sent’s artwork below! Very Talented Artist. I used to drive a truck through Chicago some, but i never saw these. Awesome!